In coordination with Factory School's recent publication of Charles Bernstein and Ben Yarmolinsky's Blind Witness: Three American Operas, we've launched a new PennSound page hosting complete recordings of all three operas, as well as videos from the Blind Witness book launch at Medicine Show, this past May. Originally written and performed nearly two decades ago, these three vernacular operas — Blind Witness News (1990), The Subject (1991) and The Lenny Paschen Show (1992) — are perhaps even more pointed critiques of American society in the present: we are still a nation at war (at war with the same country, in fact), still a nation obsessed with the news, with celebrity, with our own inner workings. However, in these works, we discover a memento of simpler times, before our slipping headlong down a postmodern precipice, and through that trace we are capable of marking tremendous differences. The nightly newscast so wonderfully parodied in Blind Witness News (with its anonymized news team of Jill Johns, Jack James, Jane Jones and John Jacks) seems quaint in comparison to myriad channels of 24-hour news, yet the same hollow tropes remain. Likewise, Jenny Midnight's psychoanalysis has a human (if sometimes sinister) touch in the age of a faceless psycho-pharmaceutical industry. And, to paraphrase Jean Baudrillard, the Morton Downey Jr-esque Lenny Paschen exists to distract us from the fact that most contemporary television is equally outrageous, equally offensive, equally artificed. Social commentary notwithstanding, the operas also provide immeasurable pleasures, starting with the uncanny juxtaposition between Yarmolinsky's lush classical melodies and accompaniments, and Bernstein's oft-hilarious libretti. Here, we see the poet's continued fascination with "authentic" speech (as delivered through television, advertisements, etc.) and common mythologies, seen in contemporaneous collections such as 1994's Dark City. In passages such as Lenny's abrasive monologue, Jack and Jane's opening fugue of news-speak, or John Jack's rendering of abstract sports arcana, we witness Bernstein's great joy in manipulating the conventions of everyday language and, can't help but enjoy it. At the same time, amidst this savage lampooning of a candy-colored culture, we also find sympathetic and world-weary characters — particularly Jenny Midnight — and this touch of empathy makes our experience that much richer. PennSound's Ben Yarmolinsky author page also includes the composer's 1995 appearance on LINEbreak, where he discusses his opera Anita, inspired by the Clarence Thomas-Anita Hill Hearings. Click on the title above for a truly unique listening experience. While Hurricane Ike bears down on the Florida Keys, we're glad to be able to share a reminder of less-worried times in that region, as PennSound launches its new page featuring selections from the Key West Literary Seminar. For the past twenty-five years, KWLS has explored key themes in contemporary literature — this past January's Seminar focused on "New Voices," while next year's will address "Historical Fiction" — through lectures, panel presentations, readings, informal gatherings, and discussions featuring some of the most influential names in American arts and letters. Recordings of the proceedings began in 1988, and with the launch of the Littoral blog and podcast series in 2007, editor-in-chief Arlo Haskell has been bringing these historical treasures to a much wider audience, a tradition which continues with our new page showcasing some of the most exciting poetry readings taking place at KWLS. We begin with a double-dose of John Ashbery, taken from the 2003 Seminar, "The Beautiful Changes": first, a brief lecture on the work of Elizabeth Bishop, followed by a reading of selections from his then-current book, Chinese Whispers, featuring, among other favorites, "Disagreeable Glimpses" and "Nice Presentation." Also from 2003, we have a reading by James Tate, which includes "The Sound of Distant Thunder," "Silver Queen," "The Animists" and "Of Whom Am I Afraid," and a quick trio of poems from Charles Simic. Then, from this past year's seminar, there's a recording of Meghan O'Rourke (poetry editor for The Paris Review and a contributor to Slate), who reads from her 2007 debut, Halflife, along with a handful of new poems. 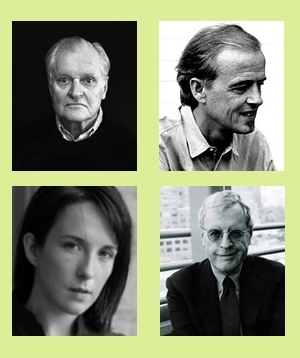 We anticipate many wonderful future additions to our KWLS page, including readings by C.D. Wright and Forrest Gander, among others. Click on the title above to start listening. Poem Talk 10: Gertrude Stein's "Portrait of Christian Bernard"
The latest episode of the ambitious and entertaining PoemTalk podcast series has just been posted — a discussion of Gertrude Stein's "Portrait of Christian Bérnard," originally written in 1928 and recorded during the winter of 1934-35 in New York City. Joining host Al Filreis for this program is a trio of first-time panelists, including Bob Perelman, Lee Ann Brown and Jerry Rothenberg, who'd just wrapped up his visit to UPenn as 2008's final Kelly Writers House Fellow earlier that afternoon. Filreis begins by underscoring the obliqueness of Stein's portrait, whose discourse doesn't even match the gender of its subject. "Stein leaves no doubt...that she's doing portraits in the same way that Picasso and Braque are doing portraits," Rothenberg notes, and both Brown and Perelman extend this notion to make the poem a self-reflexive portrait of its author, framed through the quotidian language of food in all its many varieties. From there, the panelists consider the poem's many pleasures — from the sensual joys of good food and the similar enjoyment of language used richly, as well as the poems many idiosyncratic repetitions, and even the knowledge that this portrait is not a portrait in a traditional sense — discovering reflections of Stein's unique aesthetic, which each illustrates with favorite quotations from her work. Returning to the subject at hand, they conclude, as Filreis notes in his introduction on the PoemTalk blog, "Stein is perhaps to the literary critic as the lover of meals is to the foodie. The foodie's irony: there's talk about food and then there is its realist purpose. What if language were really seen in such a way? We'd all be happier." As the fall unfolds, stay tuned for new PoemTalk episodes featuring Ezra Pound, Erica Hunt, Wallace Stevens and Kathleen Fraser, and keep an eye on PennSound Daily for more Rothenberg-related news later this week. On Wednesday, we launched the latest episode of the PoemTalk podcast series, which featured Jerry Rothenberg as a panelist. Today, we're announcing that his tour de force reading from the 2008 Kelly Writers House Fellows Program, recorded the previous evening, is now available as individually-segmented files. Drawing heavily from the three books collected in Trilogy (Poland/1931, Khurbn and The Burning Babe), as well as 1968's Technicians of the Sacred, 1999's A Paradise of Poets and 2003's A Book of Concealments, the poet read for nearly ninety-minutes, leaving his audience clamoring for more as he concluded with "Night Poems in Memoriam Jackson Mac Low," and a rousing rendition of A Seneca Journal's "Old Man Beaver's Blessing Song," a favorite of the students with whom he'd worked during his visit to UPenn. Of course, Rothenberg's illuminating conversation with PennSound co-director Al Filreis is also available, as is PoemTalk #7, in which Filreis, Bob Holman, Randall Couch and Jessica Lowenthal discuss Rothenberg's poem, "A Paradise of Poets." Since his springtime visit, Rothenberg has kept busy, launching his new blog, Poems and Poetics, as well as the collection Poetics and Polemics: 1980-2005. This Sunday, from 4:00-6:00 at the Bowery Poetry Club, he'll be leading a 40th Anniversary Celebration of Technicians of the Sacred, which will also feature Charles Bernstein, George Economou, Bob Holman, Pierre Joris, Charlie Morrow, Rochelle Owens, Nicole Peyrafitte, Diane Rothenberg, Carolee Schneemann, and Cecilia Vicuna. Click here for more information on that event, and click here to experience Rothenberg's masterful April reading one more time. Earlier this summer, poet Tom Mandel was kind enough to make the drive up from Delaware to visit Studio 111 for a luxuriously lengthy recording session showcasing nearly thirty years of his written work. The voluble and entertaining poet shared a number of new poems, as well as selections from Ready to Go (Ithaca House, 1982), Letters of the Law (Sun and Moon, 1994), Ancestral Cave (Zasterle Press, 1997) and To the Cognoscenti (Atelos, 2007), providing illuminating introductions and humorous asides along the way. From brief, early compositions such as "Spoken Quotation," "Filmic" and "Biography," to a number of his "Moscow Metro Station Mosaics," through to his conclusion with the long-form poems "To the Cognoscenti," and "The Cave," these thirty tracks provide an excellent overview of Mandel's poetry and poetics. Moreover, as part of a generation of San Francisco poets — including Ron Silliman and Alan Bernheimer — who found their primary careers not in the academy, but in the computer industry, he speaks to his own lived experience when he avers, "Being a poet is an activity that ought to be marginal — that is to say that you ought to do other things in your life . . . Poetry is not a profession it's an action, and a poet is not a professional, he's an actor in history," during his introduction to the poem, "No Takers." We've also recently added Mandel's June 24, 1979 lecture, "Spinoza: Philosophy and Poetry," recorded by Bob Perelman, which runs for more than ninety minutes — one of many recordings from Perelman's Talks series, which we added at the tail end of the summer. Stay tuned for a future PennSound Daily entry detailing those new additions, and in the meantime, click on the title above to enjoy this fantastic reading by Tom Mandel, along with the other delights available on his PennSound author page. We've just added five episodes of the long-running poetry series, Cross-Cultural Poetics, hosted by poet and editor Leonard Schwartz, and broadcast from the studios of Evergreen State College's KAOS-FM in Olympia, WA. In this new programs, we see, in a microcosm, the show's ambitious aims, encompassing the worlds of poetry and prose, music and theatre. We begin with a trio of readings by Prageeta Sharma, Rachel Zolf and Lou Rowan in episode #170, followed by the one-two punch of Paul Hoover and Bill Berkson, whose selections from his latest book of poems, Our Friends Will Pass Among You Silently nicely complements his reading from Sudden Address: Selected Lectures 1981-2006 in episode #169 (posted earlier this summer). From there, we move on to the pairing of poet Edwin Torres and novelist Nuruddin Farrah, both of whom read from their latest publications in episode #172. Episode #173 features playwright Richard Foreman, who discusses his new mixed-media play, Wake Up Mr. Sleepy! Your Unconscious Mind Is Dead!, and Violaine Huisman, who shares her recollections of Autodafe, the influential journal she formerly edited. Finally, in episode #174, Alice Shields shares excerpts from, and discusses the composition of, her new opera, Criseyde, which was featured as part of this year's Vox Festival in New York City. We're very glad to be able to share these latest shows and will look forward to future episodes in the series. Click on the title above to visit PennSound's Cross-Cultural Poetics Page to listen to the programs we've higlighted, and many, many more. 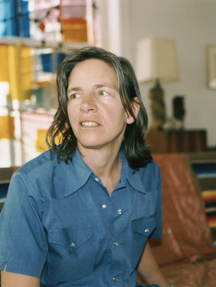 Today, we've added eleven new singles spanning the writing life of author, critic and pedagogue, Eileen Myles. From a pair of late-70s New York City recordings — including "Classical Gass," featured on The World Record: Readings at the St. Mark's Poetry Project, 1969-1980 — through to a number of more recent readings from Maxfield Parrish: Early and New Poems (1995), Cool for You (2000), Not Me (1992) and School of Fish (1997), these tracks paint a broad portrait of Myles' talents, from poetry to prose, memoir to manifesto. We've also posted a new downloadable video of Myles' "Iceland Song" from Hell (her operatic collaboration with Michael Webster), complete with live musical accompaniment — a rousing performance which further underscores the poet's strengths on stage and on the page. These new materials join Myles' October 1978 Segue Series Reading from the Ear Inn and her November 2007 appearance on LA-Lit, both of which were added over the summer. Of course, there are many other fantastic recordings available on her PennSound author page, including her segmented Segue Series Reading at the Bowery Poetry Club last spring, and singles from two wonderful compilations, Kenning (edited by Patrick F. Durgin) and Frequency Audio Journal (edited by CAConrad and Magdalena Zurawski). Clicking on the title above takes you directly there. We're starting the week off with a pair of new recordings from Ron Silliman, which come to us courtesy of Jack Krick, Electronic Poetry Center Senior Editor and a good friend of the PennSound project, who's been taping poetry events in the Philadelphia area for more than twenty years — cf. Charles Bernstein's 1988 reading at Temple University, one of his earliest recordings. The first reading, from a March 17, 1997 visit to Lehigh University, showcases a lengthy excerpt from Silliman's 1975 poem, Sunset Debris — a favorite work whose voice (it was written in his mid-20s) and form (an overwhelming litany of questions) seemed most readily graspable to his college-age audience. In his introduction, he demystifies its "dramatic" title (it's the name of the garbage company in San Francisco) and notes that the poem feels somewhat anachronistic in that the visceral carnality woven throughout clearly reminds him that, "this is a text that was written before AIDS occurred." Silliman demonstrates his commitment to poetic discourse in the accompanying question and answer session which runs even longer than the reading itself. Our second recording, of a PhillySound reading at La Tazza on August 8, 2003, features three poems from the recently-released collection, The Alphabet: "VOG," "Seven Sad Forests" and "Woundwood." On Silliman's PennSound author page, you'll find numerous additional recordings of poems from The Alphabet — in Segue Series readings from 2000 and 2005, along with his 2004 reading at the Kelly Writers House — as part of our larger collection of readings, lectures, podcasts and conversations spanning the past three decades.